Macaws are perhaps the most easily recognizable birds in the parrot family. Colorful and entertaining, these birds have been kept as pets for hundreds of years. These birds are characters, each having different personalities, likes, and dislikes. Due to their size, macaws can be challenging to care for, but they are loyal companions who are worth the time commitment. Here are a few fun facts about these playful members of the parrot family. There are over 370 different types of parrots on Earth, and macaws are the largest. Macaws normally weigh between 2 and 4 pounds, which is fairly hefty for a bird. 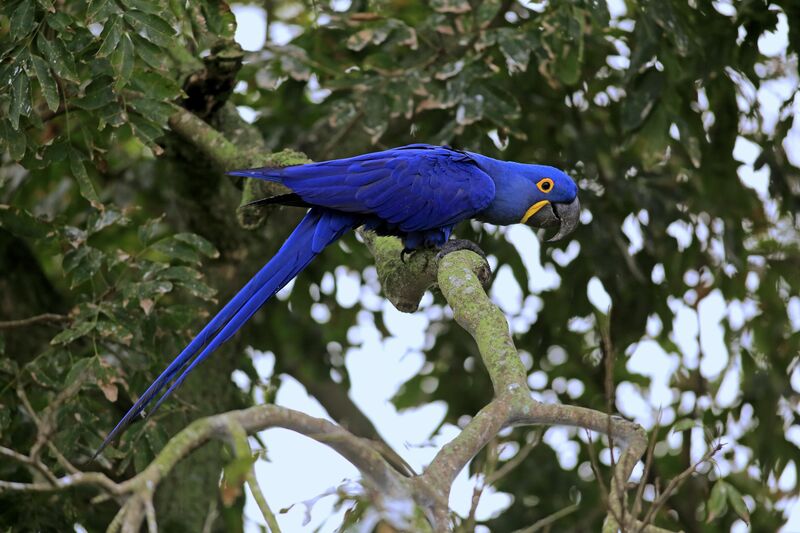 The largest of the macaws, the Hyacinth Macaw, can reach lengths of nearly three and a half feet long from the beak to the tip of the tail. In addition, they boast an impressive wingspan of up to 60 inches. While macaws are widely known as the largest parrots, it is worth noting that there are many different types of macaws that come in a variety of sizes. The smallest macaws, known affectionately as Mini Macaws, sometimes only grow to lengths of 12 inches, about the size of a medium sized conure or large parakeet. No matter how big or small they are, all macaws (with the exception of the Hyacinth Macaw) share a few common attributes, the most prominent being the bare rings of skin around their eyes. For many people, this is the most recognizable trait among macaws. When properly taken care of, some macaw species, such as Blue and Gold Macaws can live for an average of 60 years, and many have been recorded to live for up to 80 years or even more. Those who are interested in adopting a macaw are strongly cautioned to make sure that they are willing to commit enough time to care for their pet. It is not at all uncommon for these birds to outlive their owners, so make the same provisions for their care as you would for any other dependent. As many different varieties of Macaws as there are naturally, breeders in the pet trade have also been able to make bold and colorful hybrid macaws. Examples of hybrid macaws include the Catalina Macaw, the Harlequin Macaw, and the Camelot Macaw. While these birds have been extraordinarily popular among pet owners, there are many who oppose the breeding of hybrid Macaws, since these birds do not occur naturally in the wild. Hyacinth Macaws have enough strength in their massive beaks to crack a coconut shell. Despite their impressive strength, Hyacinth Macaws are actually known as the "gentle giants" of the macaw world due to their sweet and affectionate dispositions, especially when raised as hand fed babies. Other types of macaws also have powerful and impressive beaks, making them a force to be reckoned with during acts of aggression or bouts of hormonal behavior. This is a major reason why macaws are generally recommended only for those who have experience keeping large parrots. And to reiterate, macaws, like all parrots, need social interaction and socialization so they don't grow bored. A bored macaw will chew on any wood it can find, and with their powerful beaks, this can mean serious destruction. Is the Scarlet Macaw the Right Pet Bird for You? Do Eclectus Parrots Make Good Pets?